​At Bali Safari & Marine Park, you can choose to enjoy your safari journey from the elephant back with our Elephant Back Safari, interact with your favorite animal up close at the Animal Encounter space, experience the wildest fine dining moment surrounded by lions, meerkats, and porcupines at the Tsavo Lion restaurant and unwind with the spectacular show of Bali Agung at our state of art theater in the park, Bali Theater or make your own big splash at our Water Park and Fun Zone. Jungle Hopper Package embarks you on an adventure in wildlife to encounter a wide variety of animals, even endangered species. Combined with traditional Balinese culture, aquarium access and special show access, we guarantee you and your loved ones an unforgettable wildlife experience. Fun and educational adventure at Bali Safari – home to hundreds of amazing animals representing over 60 species. Your experience will include seeing rare and endangered species, such as the Komodo Dragon, Orangutan, and the Bali Mynah bird. Take your family and friends on a complete, fun-filled theme park adventure at Bali Safari! Your Leopard ticket gives access to thrilling rides, before or after your safari journey, and is inclusive of exciting attractions, lunch, photo opportunities, Waterpark access and 10 minutes on the back of an Elephant! ​Experience Wildlife in a Legendary 4x4 Land Rover. ​Immerse yourself in the home of hundreds of amazing animals - Bali Safari is your destination for an adventurous, fun, educational experience. See animals representing over 100 species, including rare and endangered species - the Komodo Dragon, Orangutan and the Bali Mynah bird. Enjoy an unlimited Safari Journey, express lines, and VIP treatment with your Rhino package. ​Experience Wildlife in a Legendary 4x4 Land Rover. While others taking a Safari Journey enjoy visiting the three open enclosures that are home to the wild animals of Africa, India, and Indonesia in the comfort of the specially outfitted air-conditioned safari trams - those joining a Land Rover 4 x 4 Safari Journey experience a true safari outing including animal feeding. Ride on the back of an elephant! Your Elephant Back Safari ticket will give you access to a fun and truly unforgettable experience. Your ticket includes access to our amazing shows, a safari journey and our aquarium. ​Your Night Safari ticket is exciting, special and full of fun. See our Fire Show, enjoy a BBQ dinner, with aquarium access and our unique shows included, you will experience a true natural wildlife encounter. ​The Breakfast with the Lions ticket lets you experience a close encounter with wildlife to start your day. You will be accompanied by our pride of lions while enjoying food at our Tsavo Lion Restaurant – safely separated by full-length-viewing glass panels. The breakfast with the Lions, including Elephant Back Safari ticket lets you experience a close encounter with wildlife throughout the day. You will be accompanied by our pride of lions while enjoying delectable cuisine – safely separated by full-length-viewing glass panels. This ticket is inclusive of a 30-minutes Elephant ride during the day. ​A spectacular cultural performance that features more than 150 Balinese dancers and musicians. The show is a fusion of traditional and modern theatrical arts. Bali Agung showcases a timeless journey through a magical theatrical performance that highlights the rich culture and traditions of Bali. It recounts the tragic and heroic legend of King Sri Jaya Pangus and his beloved Chinese wife, Kang Ching Wie. ​Tsavo Lion Restaurant is the first African-themed restaurant in Asia that allows you to have a close encounter with real wildlife. This fine dining restaurant is located side by side with the lion's exhibition. You will see a pride of lions in their natural habitat while you enjoy a unique culinary experience. 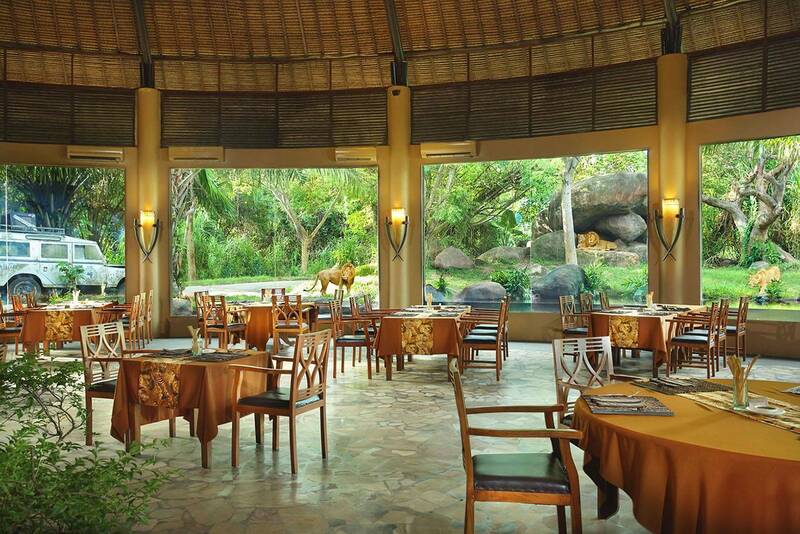 ​Take a break from your Safari fun and taste delicious cuisine made with traditional Balinese recipe at Uma Restaurant! This all-day dining venue – with its unique ethnic village theme – serves international, Asian and local specialities freshly served buffet style. 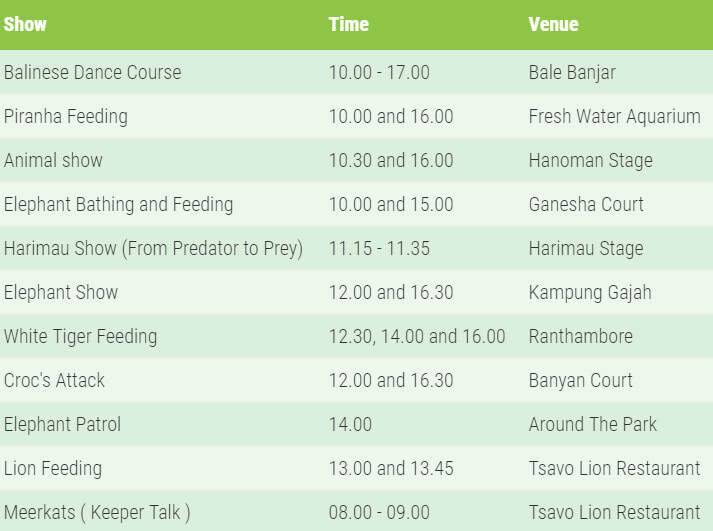 Please reconfirm your pick time and pick up location to the Information Center ​at Bali Safari and Marine Park ​!! !